NyGuard EZ1 IGR Concentrate is a juvenile hormone mimic that breaks the life cycles of more than 50 pests, including cockroaches, fleas, mosquitoes, ants and flies. Reference the product label for the full list of pests killed or controlled. It works indoors and outdoors so it can be used to treat more places. It is offered in a convenient, pre-measured, easy-to-use, single-dose package so you save more time. NyGuard IGR Concentrate is so versatile it gives you the power of more. **Pyriproxyfen, the active ingredient in NyGuard® IGR, has EPA reduced risk status in food handling. What package sizes are available for NyGuard EZ1 IGR? What is NyGuard EZ1 IGR and how does it work? NyGuard EZ1 IGR is an insect growth regulator (IGR) and has had a unique mode of action. NyGuard EZ1 IGR acts on the immature life stages of labeled pests and prevents them from becoming mature, reproducing adults. By breaking the lifecycle of a pest, an insect growth regulator helps reduce overall pest populates. When used in conjunction with an adulticide insecticide, it can help control infestations and re-infestations. Always read and follow the label instructions. Is NyGuard EZ1 IGR the same as NyGuard IGR? 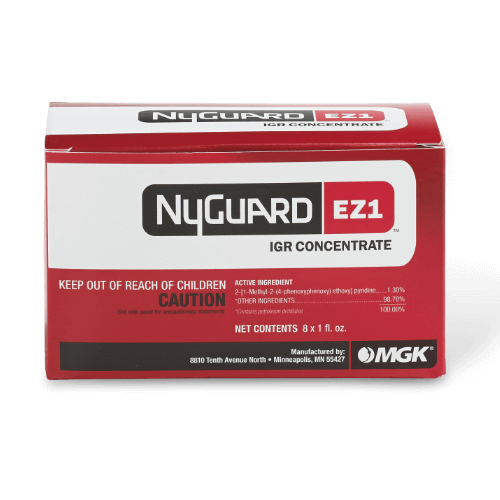 NyGuard EZ1 IGR and NyGuard IGR use the same active ingredient, have the same mode of action and can be used for the same pests and use sites. However, NyGuard EZ1 IGR is a different diluted formula for 1 ounce single dose easy mixing. Can I combine NyGuard EZ1 IGR with another insecticide? Yes, NyGuard EZ1 IGR can be used in conjunction with an adulticide insecticide as directed on the label. Always read and follow the label instructions.